Koh Mak is a medium sized, largely flat, Island is covered in rubber and coconut plantations with long curving sandy beaches. A single track twists and turns its way around the island and offers the opportunity to find a deserted beach or explore the island. 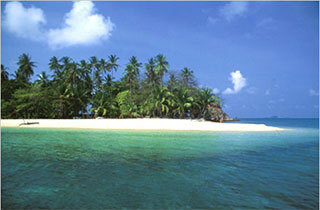 Koh Kood Island is covered in tropical forest with high mountain peaks. The island has some some beautiful beaches with crystal clear waters and some intact coral reefs. There is a beautiful waterfall, Klong Chao, in the interior. Koh Kood remains a largely undeveloped island. 4 days, 3 nights accommodation at good quality resorts, return transfers from Bangkok or Pattaya, excellent food, an all day snorkeling tour and a afternoon sightseeing tour of the island. Snorkeling in the clear blue waters of the Koh Chang Marine National Park where the water is always clear and there is an abundance of fish, coral and other wildlife to be seen. The boat stops for 1 hour at each of the following islands; Koh Thong Lang, Koh Rung, Koh Loan and finally, the beautiful island of Koh Wai where you will have the chance to swim, snorkel or just relax and soak up the tropical atmosphere. Set in a wonderful botanical garden, natural surroundings white sandy beaches, crystal clear waters and pure nature.